We now live in the computer/information age and electrics is in every facet of the car. The electrics is the life blood of the working system and must be monitored at all times. The heart and soul of the electrics is the battery. The battery is a pressure pump which pumps electrons to every working area of the car. Relevant information (data) is given to the computer (the brains). The computer then activates various actuators to work different components of the car… Simple right! Well…er…yeah… When everything is going well… but like with any computer, glitches and faults can happen. Also cars are subjected to extreme amount of heat and vibration. I get asked the question, `DO YOU HAVE THE LATEST DIAGNOSTIC EQUIPMENT?’ The truth is the latest diagnostic equipment does not fix the problem, it only gives you a reference point. Only a complete understanding of procedures and systematized method is the way to accurately overcome electrical problems. 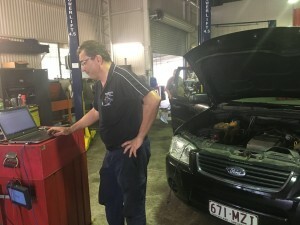 At Manny’s Mechanical Repairs Enoggera, we not only spend thousands of dollars on diagnostic scanning equipment and the fastest computer based lab scope to get more accurate data, but we are constantly developing better diagnostic SKILLS, understanding relevant data and developing faster core competencies to solve more complex electrical problems. For immediate assistance with car electrical problems and repairs please call Manny @ MANNYS MECHANICAL REPAIRS @ 0411 496 621. At Manny’s Mechanical Repairs you are in good hands, our main services include, Safety Certificates, Logbook Service, Free Pickup & Delivery, and Car Cooling System Repairs. We have the latest diagnostic equipment and my work van is fitted out with an industrial air compressor. This enables me to perform heavy duty work and give you – the customer – the best service at any place and at any time. For Bookings and enquiries, please contact us on 0411 496 621, email us atagrade@mannysmechanicalrepairs.com.au or visit our site www.mannysmechanicalrepairs.com.au.